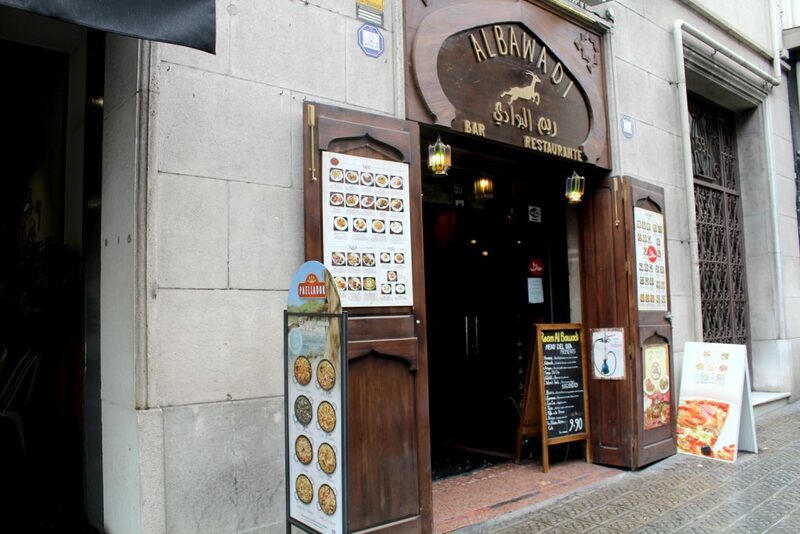 I had no idea that Middle Eastern cuisine was a thing in Barcelona, there are a huge variety of restaurants to try, and as we are huge fans of this type of food, we thought why not? Reem Al Bawadi was the choice and a very good one I might say. Hubby: Combinat mixte – Assorted lamb, veal and chicken skewers with hummus, mutabal, fattoush and falafel. Mine: Combinat Shish Taouk – Chicken skewers with hummus, mutabal, fattoush, and falafel. 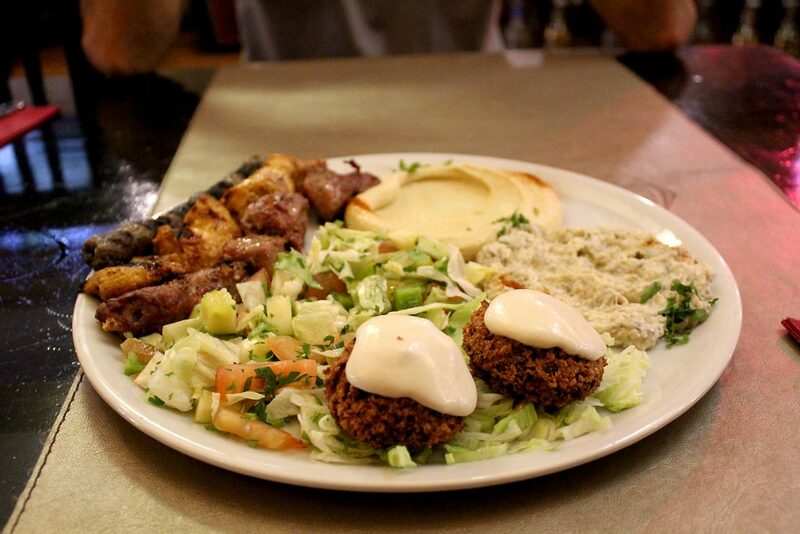 Combinat mixte – Assorted lamb, veal and chicken skewers with hummus, mutabal, fattoush and falafel. 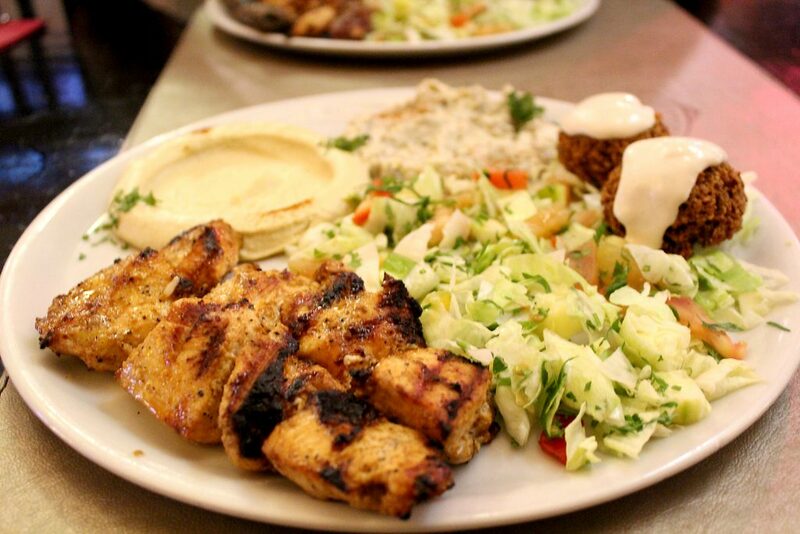 Combinat Shish Taouk – Chicken skewers with hummus, mutabal, fattoush, and falafel. Everything was superb. A special note goes to that mutabal. This was the first time we met and this guy has already a special place in my heart. If you are wondering what mutabal is, it’s a dip, made of eggplants, very similar to a baba ganoush (my fav) but not the same. The are some lumps of eggplants in the mixture and the seasoning is completely different. I highly recommend this place, not only for their food packed with flavor but also the awesome prices and huge portions.